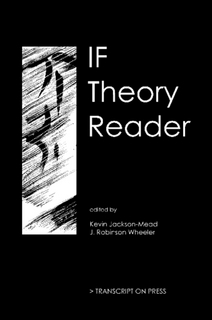 IF Theory Reader by Kevin Jackson-Mead and J. Robinson Wheeler was published in late February 2011. It is intended to be a book about both the craft and theory of interactive fiction. It reviews past IF achievements, summarizes current IF discussions, and suggests possible ideas to pursue in future works of IF. This work was called the "IF Theory Book" during its long development. Eventually after a long hiatus and a change of editors, the book was finally published. Note: The Glossary category on this wiki was originally created on another wiki to be included in the IF Theory Book. 2 Staff for "IF Theory Reader"
3 Staff for "IF Theory Book"
Staff for "IF Theory Reader"
Staff for "IF Theory Book"
NOTE: This section is no longer accurate and is included only for historical reasons. Theory Section Editor: Dennis G. Jerz. Additional Editors: Jon Ingold, Brendan Barnwell, Brent VanFossen, and Adam Thornton. IF Theory book / narrative vs puzzle - rec.arts.int-fiction thread from November 2001. IF Theory book / academia vs others - rec.arts.int-fiction thread from December 2001. IF Theory Book, update. Emily Short steps down as chief editor in favor of Kevin Jackson-Mead in September 2010. This page was last modified on 8 May 2012, at 18:03.